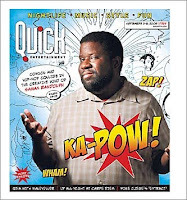 i'd be telling a "bold faced lie"- as my nanna would say- if i tried to tell you i wasn't proud as can be to have my artwork on the cover of the Quick this week (even MORE proud than i was to be ON the Quick earlier this month). i have no idea at all how many issues of this they roll out every week, but it's gotta be in the tens of thousands, at least! 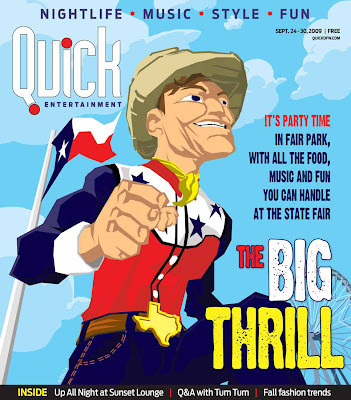 for those not in the DFW metroplex, the Quick is a local entertainment paper published by the Dallas Morning News and available free of charge all over the area. they come out every Thursday and are full of events, restaurants, and other assorted crap for you to add to your "to-do" or "wish-i-had-time-to-do this weekend" lists. the issue will be everywhere you look until about Tuesday, then right on cue another will take its place the following Thursday. when i worked the graveyard shift at a call center, they dropped a bundle everyday at around 3am that stayed in the break rooms of the building all week. The idea that my art will be sitting in the break room at my old job, that my former coworkers (including the haters) will sit and read from it while they drink their coffee or energy drinks (without realizing it's my art they're holding)... that's exciting to me! that's the funny thing about being an artist. i WANT people to gravitate to my work... to look at it, and say "now THAT'S cool" or generally to get something out of it. but i'm not all that interested in fame. i want my work to be recognized, but not necessarily to be recognized myself too much. all month, people have been stopping me and saying "weren't you on the Quick? ", and while my 15 minutes was fun, it means more to me that my artwork is on the cover, even though most people won't even know it's my work. but I will know. All my Dallas/Fort Worth area people, pretty soon you will start seeing this drawing around town... i was contracted to draw an image for the cover of a local publication for their issue about the State Fair of Texas. the cowboy is Big Tex, a massive inflated figure at the fairgrounds in Dallas. 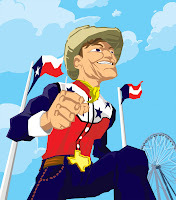 Big Tex is an iconic figure in Dallas, synonymous with the State Fair, so I chose to do a piece focused on him (because of the kinda guy I am, I decided to draw him walking). this piece was drawn 100% in photoshop, in case you're wondering. anyways, i hope you guys like it... and for all the local readers, when you see this, it's all me! Saturday at 2pm is the ribbon-cutting for the Art Park Statues, one of which was painted by me. i will most definitely get more pictures of my piece (much thanks to dude Pat Favors who was cool enough to take this one of me working on it). if you're in Dallas tomorrow afternoon, drop by. i'll take some time away from my drawing table (gasp!) to attend, so you can kick it with me and the other artists at N. Good Latimer and Commerce! in fact, there's a ton of artsy festivities in Deep Ellum tomorrow. 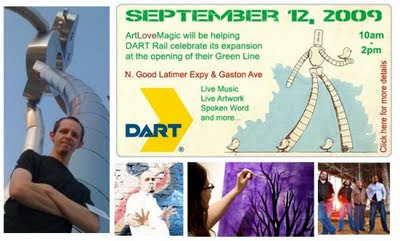 my peoples from ArtLoveMagic are helping kick off the opening of the Deep Ellum DART rail station just down Good Latimer at Gaston. click the flier above for the 4 eleven. it's been very hectic lately... if you didn't already know, my work on my blog/magazine ghettoManga landed me on the cover of one of the local newspapers, i spent several days traveling to downtown Dallas to complete this Art Park painting, and my daughter Marley celebrated her first birthday this week (09.09.09... photos coming soon)! and that's to say nothing of the freelance projects i'm working on! things are going great, and I am very thankful, if a little exhausted. for those who attend tomorrow, i'll see you there... otherwise, i'll catch up to you on the internet!